A gas fireplace can provide an efficient way to heat your home which also looks great. Like most household appliances, gas fireplaces can run into their share of problems over the years. Before you call a repair service, familiarize yourself with a few common issues and the easiest ways to troubleshoot them in case it's a fix you can make yourself. Before you try to figure out what is wrong with your gas fireplace, it will be helpful to familiarize yourself with the basic parts and functions, which can help you isolate any issues. Gas fireplaces come in three main types: natural vent, direct vent and vent-free. Natural vent fireplaces rely on a metal pipe to ventilate the fireplace, which runs through the roof of the home. Direct vents ventilate directly into the wall behind the fireplace and vent-free fireplaces require no ventilation at all. All gas fireplaces run on natural gas or propane and come equipped with a variety of ignition types, including those that stay lit all the time, types that require a lit match to ignite and models that you turn on with an electronic switch or remote. If your gas fireplace feels overwhelming, don't worry—although there are a number of parts to keep track of, the most common issues are usually limited to a few suspects. 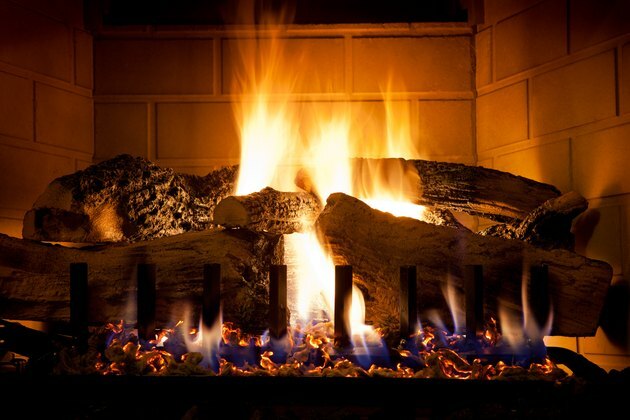 To troubleshoot your fireplace, start by ensuring your thermostat is turned on and set to a high enough temperature. If your fireplace won't ignite, check your breaker box to make sure the fuses and trips are working and replace any that aren't. If they are, make sure you have enough gas or propane in your tank, and that the gas valve is open. Sometimes fireplaces and other heating devices stop working when the pilot light has blown out. If the pilot light flame is out, carefully re-light it with a match. If your light is on, check the wiring that leads to the pilot light and reattach any loose or disconnected wires. Strange smells coming from your fireplace could be from something that got stuck in the flue, so if you think that's the case, turn your fireplace off, ventilate the house and call a professional if you can't spot and dislodge the obstruction. Do the same if you smell gas inside the home, and do not light any matches or lighters before the area has been ventilated. For odd sounds like a low rumbling, adjust your pilot light and see if it stops; if your fireplace sound more like a roar or a shriek, clean the burners or replace the blower if need be. Most simple fireplace fixes can be made by yourself at home, but always be sure to take special care and precaution before tampering with a gas-powered item, and don't hesitate to call a professional if you can't easily detect the problem. Be sure to have your fireplace inspected every year, and install a carbon monoxide detector in your home, especially if your gas fireplace runs frequently during most of the year.